As a certified WAE yoga & meditation teacher I skillfully & safely hold the space for veterans & their families as they learn how to incorporate yoga & meditation to support their ability to become healthier, more resilient, & feel more at ease in their minds & bodies. Veterans Choice Program: Please use these services if they are available to you. See guidelines for access to services below. Warriors At Ease Program: I am able to hold two private sessions per week specifically for NH military veterans and family members who have economic hardship and are struggling to feel at ease in their everyday lives. These sessions are donation based on a sliding scale that feels right for each individual. Nobody will be turned away due to lack of funds. Read more about WAE below. Kim Gebro, LLC: You also have the option to see me at any time as a private pay client if you are not currently in need of economic support from WAE. I am currently seeking another yoga and meditation teacher to bring into the WAE family. There are WAE scholarship funds available for a 200-hour registered yoga teacher who is inspired to serve NH veterans and their families. 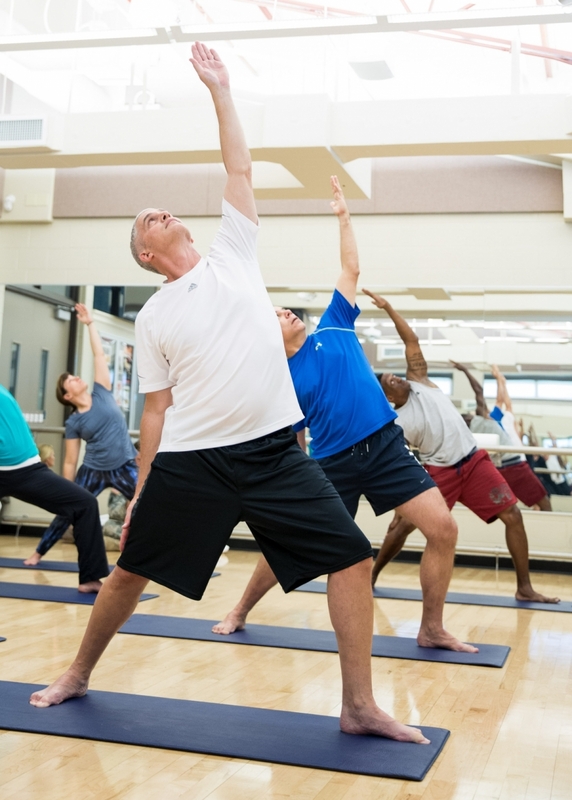 WAE encourages active duty service members, veterans, and their family members who have been touched by the power of yoga and meditation to become WAE teachers. Please contact me for more information. Get approval from your VA PCP for treatment for your condition (PTSD, TBI, chronic pain, insomnia, anxiety, depression, etc.). Your PCP is responsible for submitting a referral for services to the VA Business Office. The business office then connects with you and shares local services that can support you. After looking through the list of possible providers, you can choose the one that best fits your needs. If I am the appropriate provider for you I will be sent an authorization and can start treating you during the time period indicated in the authorization. What is Warriors At Ease? Warriors At Ease is a national non-profit organization whose mission is to increase awareness about the power of yoga and meditation in order to support the health and healing of service members, veterans, and their families. They teach qualified mind-body practitioners how to effectively share trauma sensitive, military culture informed, evidenced-based practices. Their T3 model (train, teach, and transform) provides scholarships and trains injured post-9/11 veterans and their spouses to teach trauma informed yoga and meditation so that they can improve the quality of lives for those in their local military communities. No. In my belief, yoga is for everyone and can be done standing, in a chair, in a wheel chair, and believe it or not, even laying still. You'll have to come see me to see how that last one works. Modifications will be provided for all body types and health conditions. No meditation experience is necessary either. I meet you exactly where you are at and build skills from there. What does trauma informed/sensitive mean? This means that I recognize that many of you have had such challenging experiences that being triggered is an everyday experience for you. At times, you may not even be aware that you are being triggered. You may all of a sudden feel agitated, angry, fearful defensive, etc. without even recognizing why. The body remembers events that were very emotional and registers those as conditioned physical responses. That means that a certain tone of voice, word, sound, facial expression, demand by another, or other stimuli will incite your body to go into the fight-or-flight response, essentially making the body feel like an unsafe place. For some individuals the trauma was so significant that they have become disembodied and unable to feel sensations in the body itself. I have been trained to cultivate a safe container where I am very conscious of the language I use, my responses to you, the environment of the class, and other factors to ensure that I am creating the most comfortable place that I can for you to practice. The most important trauma informed factor is being able to be present with you as you navigate what is arising in any given moment. What kind of meditation do you use? I use a combination of a meditation protocol called iRest® as well as other mindfulness meditation techniques. In 2006, Richard Miller, PhD, worked with the Department of Defense to research the efficacy of iRest® meditation protocol for soldiers returning from Iraq and Afghanistan. These individuals engaged in iRest® sessions at Walter Reed Army Medical Center (WRAMC) and experienced profound results. Individuals in over 50 VA and military settings have benefited from this method of addressing PTSD symptoms ever since. Meditation and yoga have been approved as a CAM (Complimentary and Alternative Medicine) for treating PTSD by the Department of Defense. More importantly, meditation and yoga have been healing people for centuries. Only recently have science and our social institutions recognized the value of these transformative practices. Why focus on providing healing modalities for the military community? My father was in the Air Force for 26 years, deployed at times, working various shifts at home, going to college when he was able, and all the while trying to support a family. Growing up, I watched my mother and other families on base do their best to maintain balance during complicated times, especially during deployments and required travel for trainings. As an adult, I married into my second family, my military family, with my ex-husband at what was formally known as El Toro Marine Corps Base in Irvine, California. I serve in honor of these families and multiple of my other family members who have served this country in various branches of the military. There are unique challenges that both service members and their families face, especially when one or multiple family members are deployed in a combat situation. It is clear that combat situations can result in trauma-related conditions for the service member, whether it be physical, mental, or emotional. Additionally, trauma can be experienced for the family due to the unpredictable nature of military life and the stress of deployment. I have immense respect and gratitude for active military members and veterans for their service and extend my appreciation to the family members and caretakers who support those individuals during active duty and beyond. Thank you. It is my heartfelt mission to provide quality trauma sensitive yoga therapy and meditation practices to support the needs of my local NH military community for these reasons. "Before working with Kim, I felt like I was always running away from something, even if it was something that I wanted, like a relationship, a friendship, or my education. I was running from fear, running from feeling, running from things that would only help me, and this fear was hijacking me so often that I was scared that I would lose everything. I felt like there was no hope despite seeing a trauma-educated, EMDR trained therapist for 2.5 years. Talking just wasn’t cutting it. It led to more fearful thoughts, like “Why can’t I do this? Why can’t I just be okay? Am I ever going to get better?” And that led to more fear, and more running. I spent much of my time ruminating on how to prevent the things that I feared would happen, and the worst part was that I was bringing them closer to happening by acting out my fear, such as failing out of a higher education program I was once enrolled in, almost failing out of another, and pushing away my partner. I feared that sabotaging all these things that mattered to me would lead me down a dark path, consumed with guilt and fear, and lead me to lose my desire to live. I felt isolated and distrustful, never felt joy, and lonely as I was, afraid to seek support from others when I was dying of thirst for connection with others. After beginning my work with Kim, I feel like I can pull a sense of safety in around me and find the calm. I can find a sense of joy and acknowledge my fear without running from it. I feel safe knowing that I can go at my own pace without judgement or criticism or risk of abandonment. I can let the fear pass over me and also do the thing that I used to fear. I can get closer to others, I can get out of bed to tend to my health, I can stop the rumination and let go of my hyper vigilance, and I can finally focus on the assignments from my doctoral clinical psychology program rather than run from the fear that activities of daily living used to trigger in me." "My husband Arthur is a WWII Marine Combat Veteran who served as a machine gunner on a number of Pacific Islands, including Guadalcanal, in the initial battles against the Japanese. Because of horrific encounters, injuries and experiences, he suffers from PTSD and suspected CTE. He had an accident almost three years ago which resulted in significant mental and physical impairment. His doctor thought that perhaps in time he would get back to a more normal cognitive state - this has not happened. My life, since then had taken a turn into a world that I really did not want to live in. The hopelessness and chaos I experienced as Arthur's only caretaker had taken its toll. If I had not had the opportunity to work with Kim, I truly do not think I would want to be alive. The coping skills, yoga and meditation offered to me by Kim are lifelines to a mind altering process of helping, loving and living with the dignity of life owed to a man like Arthur. Kim has helped me on a path of knowing that I can be compassionate and caring for myself and not be a martyr who sees care-taking as a "road to heaven"...This way of looking at life was resulting only in depression and terrible anger at my husband and the world. This attitude paralyzed me when it came to dealing with the new life style forced upon me. Learning ways of finding roads to self-compassion and self-caring make me so much more able to understand what my husband needs and deserves instead of going down into the pit of "poor me". There is hope, laughter and understanding in my home now - doesn't mean that I am always "Suzy Sunshine" or "Pollyanna" but living a life of dealing with reality without being pulled into a sewer and knowing what to do when despair hits me." "There are not enough positive adjectives in the English language to truly or accurately define the Warrior At Ease program in general or Kim Gebro. My experience with the WAE program is just beginning, and even so I feel I have found someone who is willing to take my back; someone who listens, truly listens, and tries to understand my particular issues. She works with me as an individual on a personal level; I’m no longer a number in a waiting room with a multitude of others waiting behind me. In the short time I’ve been working with Ms. Gebro I have come from a true and dedicated skeptic to feeling that there truly is something to her method of madness. I, for the first time in many years (if ever) sense a light at the end of the tunnel; and this time it’s not the headlight of an on-coming train bearing down on me like I’m Wile E. Coyote! I’ve actually begun moving in the direction of the light instead of running from it. The work I am doing with Ms. Gebro is impactful to me as a man who came out of the military a bit banged up, broken, and feeling alone. It’s hard to fight alone when one is taught to do so as a team, a platoon, as a Tribe of Brothers and Sisters. Ms. Gebro is making an impact, here in the forest, reaching out to me and my Brothers and Sisters. She does not bandy about “Thank you for your service” lightly, she reaches out into the shadows and pulls us into the light of her fire and attempts to ease our pains, our hearts, and our souls. So far, this is the only thing that has helped to alleviate the chronic pain and PTSD symptoms that I’ve been facing. I work hard, but she… she right there in front of you, works harder; trust me. Kim has proven to me personally that she cares, she really cares."